recipient: To All People on Planet Earth, Who Love Dogs and Animals. Help STOP the HORRIBLE ANIMAL CRUELTY in CHINA; Up to 100,000 Dogs and other Animals "Skinned ALIVE" per day in CHINA is allowed by their government and corporations for their FUR trade. Watch the Video proof of Animal Cruelty Crimes in CHINA. The investigators filmed animals that were kicking and writhing as workers ripped their skin from their bodies. If the animals struggled too much, workers stood on the animals' neck or they beat the animals' heads with knife handles until the creatures stopped moving. It's also a very slow process, and they usually start from the feet (paw)-up, giving the animal plenty of time to endure the pain. After their fur was peeled, the animals' bodies were tossed into a pile like so much trash, most still alive, breathing in ragged gasps and blinking slowly. One investigator recorded a skinned raccoon dog, tossed onto a heap of carcasses; it had enough strength to lift its bloodied head and stare into the camera. The poor dog raised its head, blinked with its remaining eyelashes and then lay its head down to continue dying for anything from 2-3 Hours. 2.Spread the word, be voice of these animals. Forward this video to as many people as you can so that they can STOP THIS ANIMAL CRUELTY. 3. BOYCOTT CHINA until this ANIMAL CRUELTY IS STOPPED forever. 4. 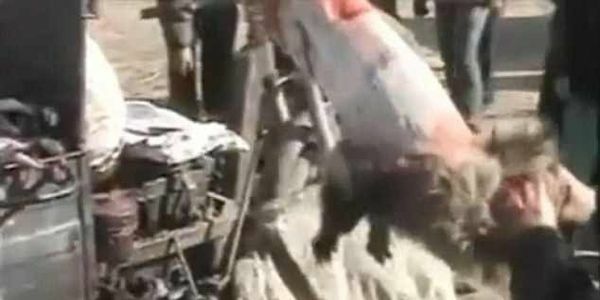 Sign this Animal Abuse and Cruelty Petition to Log your PROTEST of every day occurring Severe Animal Cruelty of dogs, pets, and animals in CHINA. Fillet "Skinning" the innocent dogs and innocent animals ALIVE, Then the Animal Abusers throw the LIVE Skinned Dogs and Animals into a pile, to ROT to death over 2-3 hours to die without any fur or skin on the animals.. The dogs and animals live for another 2-3 hours suffering unspeakable PAIN and Suffering a horrific PAINFUL DEATH. The mutilated dogs and animals can still raise their heads, blink their eyes, and wiggle around in total PAIN, after having no fur or skin on them. It is Animals Cruelty beyond any human description. Help us STOP the HORRIBLE ANIMAL CRUELTY in CHINA. Unspeakable numbers of over 100,000 innocent Dogs and other innocent Animals per day are"Skinned ALIVE" in CHINA. This is allegedly allowed by their government and their corporations for their FUR trade. Watch the Video proof of Animal Cruelty Crimes in CHINA attached to this petition. This should be FRONT PAGE NEWS on all MEDIA worldwide... Will you HELP us? 4. Sign this Animal Abuse and Cruelty Petition to Log your PROTEST of every day occurring Severe Animal Cruelty of dogs, pets, and animals in CHINA. Fillet "Skinning" the innocent dogs and innocent animals ALIVE, Then the Animal Abusers throw the LIVE Skinned Dogs and Animals into a pile, to ROT to death over 2-3 hours to die without any fur or skin on the animals.. The dogs and animals live for another 2-3 hours suffering unspeakable PAIN and Suffering a horrific PAINFUL DEATH. The mutilated dogs and animals can still raise their heads, blink their eyes, and wiggle around in total PAIN, after having no fur or skin on them. It is Animal Cruelty beyond any human description. Please SHARE this Petition Link with everyone on the Planet Earth and SAVE these innocent dog's lives. Thank you for your support.